You are currently browsing the Pontiac Paradise Shop Talk weblog archives for August, 2010. Photo for mounting 64 dash tachometer! Here it is! Center hole is 1/2″. Be sure to file the edges smooth as to not tear up the wiring. Side holes are the size just above 5/16ths. Count those ribs! 63 and 65-66 photos coming soon! 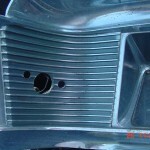 65-68 Bonneville Ragtop & Four Door Trunk Pan Sets!! PontiacParadise.com has just recieved a boatload of rust free full size 63 to 66 Pontiac parts, including Catalina/GP frames, cross members, fenderwells, deck lids and 2 door hardtop doors. All parts are rust free. Please email us for your requests. Back on April 26, 2010, I purchased a set of “done” Pontiac 76 1965 only cylinder heads from a John Lakeya in Highland, MI. They were paid for with a Money Order. I never recieved them. This was thru eBay and they did cover the purchase. I did recieve one email saying he was having some personal problems but that was it. Of course, his eBay account had no phone number and just a zip code. I needed these heads and now am forced into doing another set. He has been removed from eBay. If anybody knows of this person and how to contact him, I would greatly appreciate an email. Thanks!